In the latter half of 2006, the Joint Information Systems Committee (JISC) commissioned a study via its Teaching and Learning committee to examine the issues surrounding sustainability of open source software. The resulting report drew together seven case studies of successful but very different open source projects and examined each project’s sustainability model. Each of these case studies has been told from the point of view of the lead developer or one of the key personnel and gives a fascinating insight into the factors that have determined the success of each project. These case studies are now presented by OSS Watch as stand alone documents in a series. This case study, examining the Moodle project, has been written by Martin Dougiamas, Managing Director, Moodle Pty Ltd.
Moodle is an open source Web application (released under the GNU General Public License) designed for producing Internet-based courses and websites. It is written in PHP, runs on nearly every available server platform, and can be used by anyone with a Web browser. It has been translated into over 70 languages and supports the popular SCORM standard for content packaging. The name ‘Moodle’ was originally an acronym for Modular Object-Oriented Dynamic Learning Environment. It is also a verb found in larger dictionaries, meaning something like a cross between ‘muse’ and ‘doodle’, describing the kind of creative tinkering that is common among Moodle developers and teachers as they use Moodle. Moodle is funded by a mixture of royalties and annual fees, and supported by ‘free’ work from a worldwide network of partner companies that provide Moodle-based services to clients. The network is led by Moodle Pty Ltd in Perth, Australia, of which I am the Managing Director. The company sets guidelines for the quality of services, handles issues relating to ‘Moodle’ in general (such as dealing with software patents, publicity etc. ), mediates disputes, runs the Moodle Partner community site, steers and manages the development of Moodle itself, and looks after the Moodle community sites. For the most part, Moodle is run as a ‘benevolent dictatorship’. I see my role as being the person responsible for creating the initial conditions for an ecosystem to flourish and although I’m very much informed by trends and discussions in the community, the major decision-making comes down to me. Moodle is a Web-based application that helps people create dynamic sites where learning communities can communicate and collaborate. Such communities may range from a university course or a secondary school class, to a professional association or company doing training. It contains a lot of tools and techniques distilled from the experiences of a huge community of educators to make these processes easy without sacrificing flexibility, and provides a variety of activity modules ranging from forums and chatrooms through quizzes and surveys, to workshops, lessons and assignments. Being open source and free, anyone can install it wherever they like. Moodle is underpinned by a belief that people learn best when they are together, and the Moodle development community strives to improve the capability of the tool so that it satisfies educational requirements around the world. Within the wider educational community in the UK, Moodle is probably one of the most well-known of all open source software projects and has been extremely influential in both raising the profile of open source software and demonstrating how an open source development can rival proprietary solutions. In 1992, at the time the Web was really starting, I was working in a user support and IT infrastructure development role at Curtin University of Technology in Western Australia and naturally fell into the role of university webmaster. Over the next few years I spent a lot of time teaching staff and students about the Internet, and addressing their needs for teaching and learning. I installed and configured WebCT 1.0 and spent a lot of time customising it to fit in with our other systems. However as WebCT evolved, I found it more and more difficult to get it to integrate with other systems we had (such as sources of authentication) and because it was proprietary, closed-licence software, I was not able to make the functionality changes that teachers wanted or allowed to fix urgent bugs myself—I had to wait for support. I found this very frustrating and decided to try to write a better system for helping teachers use the innate power of the Internet. In 1998 I started working on Moodle in my spare time, and in 2001 I resigned from my university job in order to take up a PhD scholarship so I could spend more time thinking about e-learning and working on Moodle. Moodle was released to the public as an alpha version in November 2001, and as a more usable 1.0 release on 20th August 2002. This version was targeted towards smaller, more intimate classes working at university undergraduate and postgraduate level, and was the subject of case studies, which I completed as part of my research, that closely analysed the nature of collaboration and reflection that occurred among these small groups of adult participants. Since then there has been at least one new version released each year, adding new features, better scalability and improved performance. Early in 2003, I launched commercial services at Moodle.com to cope with the many requests for hosting, consulting and other services required by Moodle users. This business grew very quickly, and soon I had enough clients to be able to support myself and work on the Moodle software in my spare time. However, by early 2004 it was clear that this model would have to change. The scholarship had ended, and the work required to generate a salary was a full-time proposition, leaving little time to work on Moodle. Faced with the choice of expanding the single business or creating partnerships in a franchise-like way, I chose the latter. I registered service marks for ‘Moodle’ around the world, created the Moodle Trust and the Moodle Partner royalty-based scheme, and started accepting Moodle Partners in June 2004. Community activity also started to take off in 2004. At the beginning of the year there were 1,000 registered Moodle sites in 75 countries and by the end of the year this had grown to 2,344 sites in 100 countries. In July 2004 we had our first UK and International MoodleMoot1 in Oxford (UK)—a one-day event that attracted around 50 delegates from 12 countries. Following the success of this event the 2005 MoodleMoot attracted around three times as many people and was extended to cover two days. In early 2005, CampusSource2 began promoting Moodle as one of their certified and recommended OSS solutions for German universities. At around the same time the first New Zealand MoodleMoot took place, with over 180 participants. By now, the demands of the existing business were again becoming too much. So, in June 2005, I moved out of my home-based office and started Moodle Headquarters as the official location for the Moodle Trust. I started hiring people slowly, as funds allowed, to help me with technical development and the administration of Moodle Partners. At the same time I gradually started to transfer my own Moodle clients to other partners in the network, which took until August 2006. In June 2005 I announced plans to integrate Moodle with the Learning Activity Management System (LAMS). This work was sponsored by the New Zealand Ministry of Education and came about partly because of the strong interest in both Moodle and LAMS in New Zealand, but also because of the perceived benefits to teachers of being able to add LAMS activity sequences to Moodle course pages. Later in the year, The Open University (UK) committed to a £5million development programme with Moodle in order to provide a more user-friendly and streamlined approach to the OU’s online student learning environment. As one of the world’s largest, oldest and most respected practitioners in supported distance learning, The Open University’s commitment to Moodle was significant. Also in 2005, Jason Cole’s book Using Moodle was published by O’Reilly and since then there have been at least six other books published (in English, German, Thai and Japanese), all of them written by independent authors. More books are also planned. To top it off, Moodle was also one of four finalists in the Best Linux/Open Source Server Application category at the UK Linux and Open Source Awards 2005. In 2006, Athabasca University (often called the ‘Open University of Canada’) moved to Moodle for its online course provision and the annual UK and international MoodleMoot was hosted by The Open University for the first time. However, in general there was more time to consolidate and we started to address several infrastructure issues such as support for arbitrary roles, consistent access to external repositories, better cross-platform support for databases, better grades performance and most importantly, compliance with all major accessibility standards. We also began planning for the future, in particular for communities of best practice (see below). Moodle Trust: The core company that maintains and co-ordinates the entire Moodle project. Moodle Community: So-called ‘Moodlers’ provide input on new features, test existing features, and provide ideas for the direction of Moodle. Users share information and stay connected to each other via Moodle community forums, blogs, e-mail, Instant Messaging, and utilities such as Skype. Members of the community also organise and attend numerous MoodleMoots around the world, providing opportunities for Moodlers to meet and discuss Moodle-based education in person. Participation in the community is entirely voluntary, even for people who work on Moodle as a full-time occupation. Moodle Clients: Clients are Moodlers who engage the services of Moodle Partners (or other non-affiliated organisations) to formally support and maintain their Moodle sites, or to provide training, certification, consulting, installation or development services to extend Moodle with new features. They also provide Partners with valuable feedback about Moodle and how it should develop in the future. Clients also pay the Moodle Trust for specific Moodle features. Moodle Partners: Moodle Partners are companies that provide commercial support to Moodle Clients. Through the royalties, annual fees and unpaid work they contribute, they play an important role in helping to fund paid developers and further the development of Moodle initiatives. By the middle of 2006 there were approximately 40 Moodle Partners worldwide providing support to nearly 1,000 institutions. Moodle Partners receive a number of benefits such as priority support from the Moodle Trust and the rights to use trademarks and other assets. Moodle Developers: Moodle Developers are spread out across the globe. Some work for institutions that use Moodle, while others have an interest in specific areas of the product and may contribute to Moodle in their own time. Some Developers are paid by the Moodle Trust, some are paid by other institutions, and others work on a voluntary basis. Crucial contributions come from the Community and Developers who work together on moodle.org to discuss, create, test and maintain Moodle code and documentation, as well as support each other and promote Moodle around the world. Some members of the community contribute directly to the Moodle Trust in the form of donations, and these total about US$15,000 per year. 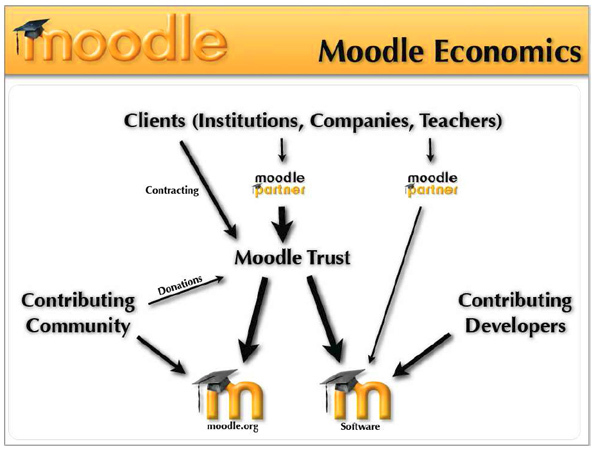 Ultimately, the responsibility for providing and paying for the development of Moodle software and the Moodle.org community sites resides with the Moodle Trust. The core of Moodle (the API and libraries) is maintained by the Moodle Trust (moodle.com). Members of the Trust are helped by a lot of feedback from volunteer users, testers and developers from around the world. As the founder and lead developer of Moodle, I take on the role of ‘benevolent dictator’: I listen to and work with the entire Moodle community to understand their needs, goals, problems etc. but ultimately I have the authority to make the final call on all major project decisions. The moodle sites (such as moodle.org, the downloads at download.moodle.org and the Moodle tracking system at tracker.moodle.org) are all maintained by Moodle Pty Ltd.
Modules and other distinct sub-projects within Moodle (such as Documentation, Translation, Security, Back-ups etc.) are generally delegated to developers who have specialised knowledge or expertise in that module or product area. Such module maintainers usually decide what changes are required for their modules, with input from the Moodle community via the bug tracker and the forums. If a module is dropped by a volunteer and there is no-one to take over, then the Moodle Trust assumes support for it until it can be delegated to a new maintainer. Some of the maintainers are volunteers who offer their time free of charge, some are paid by other companies and some are funded by the Moodle Trust. For example, the Quiz module is largely maintained by Tim Hunt from the Open University, and his contribution is considered to be part of his role there. Our new Moodle networking system is being maintained by Catalyst, one of our Moodle Partners, who is being funded by a consortium of universities in New Zealand. The main documentation, however, is collaboratively written by the community on our wiki site, in over 20 languages, and evolves constantly. It’s usually slightly behind actual releases. The ‘documentation steward’ of the site is an administrative role, performed by a volunteer (Helen Foster). Security and back-ups are two examples of jobs that were performed by volunteers, but are now maintained by employees of Moodle Pty Ltd. There are no hard and fast rules around whether a module is allocated to a volunteer or paid employee. Funds are limited, so a lot of it depends on who can provide resources or funding for things, and how important a feature or module is perceived to be. It also depends on the nature of the task and on the skills and time of volunteers (if there are any, even) as they will often have changing availability. Each case needs to be evaluated individually as, ultimately, the maintainers are directly answerable to the community for work that they do. For core issues or issues that cross several modules I make the final call based on public discussions with the Moodle community and the developers involved. I will also get involved in management and decision-making in individual modules, along with the Moodle Trust, if development goes off-track or there is significant public feedback that requires it. Software releases and maintenance of the main Moodle websites are done by the Moodle Trust under my supervision. The current Moodle Partner model is proving stable and sustainable for the foreseeable future. Expansion of the Partner network around the world is essential to enable further growth and there will be a greater focus on finding funding for specific Moodle feature developments from industry, learning institutions, and government grants. Since this document was written, Moodle has continued to be managed and developed according to the structure described above. Investigations were taken into setting up a Moodle Foundation, but the legal costs and complexity outweighed the benefits at the time so this was abandoned. Moodle Pty Ltd remains sole trustee for the Moodle Trust, while further restructuring is currently being investigated. Since the release of Moodle 2.0, regular releases have been made every 6 months, with focus changing in response to user feedback. The current main focus areas are mobile, usability, analytics, notifications, outcomes and program managment. The current stable version of Moodle is v2.6. There are just under 65,000 registered, active Moodle installations. Private discussions also happen over Skype, Elluminate, IRC and in person at Moodle conferences. moodle-cvs@sourceforge.net is a mailing list where all commits are posted automatically. The sustainability study from which this case study is taken was commissioned by the JISC Learning and Teaching committee and funded from HEFCE’s IT Infrastructure funds. The Learning and Teaching committe is responsible for supporting the learning and teaching community by helping institutions to promote innovation in the use of ICT to benefit learning and teaching, research and the management of institutions. The sustainability study was edited by Gaynor Backhouse of IntelligentContent and her editorial guidance has contributed in large part to the excellent result.